M.E. in Mechanical Engineering is a 2-year postgraduate program in Mechanical Engineering Course. The minimum criterion for enrolment includes passing B.E. or B.Tech. in either field of Mechanical, Production, Mechatronics, Automobile or Manufacturing with an aggregate of 55% marks and above. The program fee in average ranges between INR 9,600 to 5.44 Lacs. Certain colleges may require candidates to qualify the various entrance examination held at state and national level for admission to the Master’s Program. The shortlisted candidates will be later notified to attend the counseling session to get an overview of the student’s traits. Based on the scores obtained in the entrance examination and qualifying tests, the admission of the applicant will be further processed. The program is an integrated study of Mechanical engineering which deals with the principles of physics and material sciences of designing and analysis. Candidates are required to hold good mechanical skills and possess the art of drawing diagrams. Knowing to operate various applications on the computer is deemed as an added beneficial quality. Having a logical mind which can join the dots between ideas and concepts will be helpful in drawing out lucrative solutions to the problem. Candidates who possess a good quality of practicability, teamwork and numerical skills are considered suitable for the program. Graduates of Mechanical Engineering have opportunities in areas of electronics, steel plants, automobile as well as opt for employment in space research organizations. 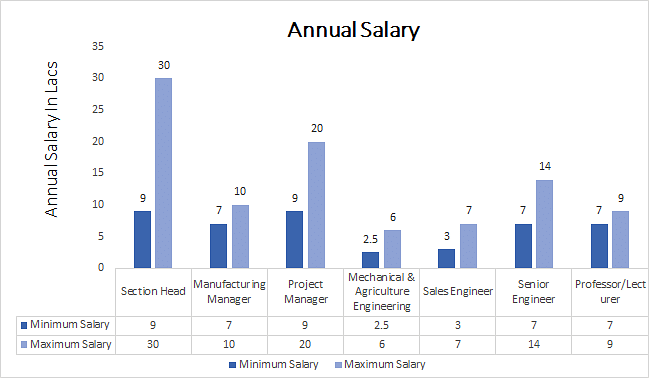 The remuneration earned by candidates after the completion of the program and taking up job ranges between INR 2 to 30 Lacs. Eligibility Qualifying B.E or B.Tech. in either field of Automobile/Manufacturing/Mechanical/Mechatronics/Production with an aggregate of 55% marks and above/ Entrance Examination. Job Positions Mechanical & Agriculture Engineer, Project Manager, Manufacturing Manager, Senior Engineer, etc. M.E. in Mechanical Engineering: What is it About? Mechanical Engineering is the branch of study which primarily deals with the aspects of designing, production, and operations of machines and tools. Integrating the fields of physics and material science, the students are rendered an in-depth understanding of the subject, thus advancing their area of knowledge. The course lays out valuable opportunities for candidates after its completion and thus in recent years, this program has seen an increase in its popularity. The program of M.E. in Mechanical Engineering concentrates on defining the aspects of usage of heat and power in production, designing, maintenance and manufacturing of mechanical systems. They are introduced to the application of numeric skills and technical skills in getting to the depth of the problem. Having a keen and tactful mind, the future engineers are able to suggest solutions to the current designs and modify them into better ones. The curriculum applies a balanced design to introduce candidates to the advanced study of mechanical engineering. They are prepared in all aspects to undertake research-oriented programs in this field. The coursework includes seminars, projects, presentation, end term examinations and generation of a thesis. Coupling this with the training program to polish the abilities to organize, teamwork and flexibility, candidates mold themselves in multi-disciplinary areas which prove to be an asset in this field. M.E. in Electrical Engineering renders to student skills and knowledge of the subject opening for them a plethora of opportunities in the areas of automobile, oil exploration, research and development, defense forces and so on. They can also opt for lucrative opportunities in areas of academics and teaching. The course aims at shaping the future of students by instilling in them the required skills to make them expert in the field. Qualifying the B.E. or B.Tech. degree in either field of Automobile, Mechanical, Production, Mechatronics or Manufacturing is prerequisite for admission. Candidates are supposed to earn a minimum aggregate of 55% marks and above in the qualifying examination. Certain colleges may require passing the entrance examination held at entry level to the Master’s program. Applicants who seek admission to the program are required to fulfill the eligibility criteria as set by the respective colleges. This includes qualifying the B.E. or B.Tech program in Mechanics with a minimum aggregate of 55% marks and above. Those who have earned a degree in Mechatronics, Automobile, Production or Manufacturing can also avail for the program. The score limit set for candidates belonging to the reserved category is 45% with a relaxation of 10%. Certain colleges may also require the entrance examination marks for furthering the admission. The shortlisted candidates will have to attend the session of counseling which is subject to differ from college to college. The admissions are later processed on the grounds of merit list, the marks of which are calculated computing the score secured in the entrance test and qualifying examination. Students are required to download the application forms from the official website of the college, the guidelines of which will be stated on the website. The coursework comprises of classroom study and practicals. The students are also offered a list of electives to choose from during each term along with the study of other subjects. The syllabus is a balance between the concentration on practical aspects and theory. This also includes seminars conducted by prominent personalities of the field, projects, and assignments rendering to students a deeper insight into the course. M.E. in Mechanical Engineering trains the students in handling complex challenges, designing systems and coming up with a lucrative solution for improving the output of machines and tools. The students gain an expanded knowledge of the different dimensions of the field and are made proficient to handle wide arena of responsibilities on the career front. After the successful completion of the course, the students have opportunities undertake employment public and private sectors. With additional qualification, they can hold senior positions in administrative and managerial fields. They have career prospects in areas of chemical, automobile, technical wings of armed forces, space research organization and many more. They can become Manufacturing Manager, Project Manager, Section Head, Sales Engineer and so on.